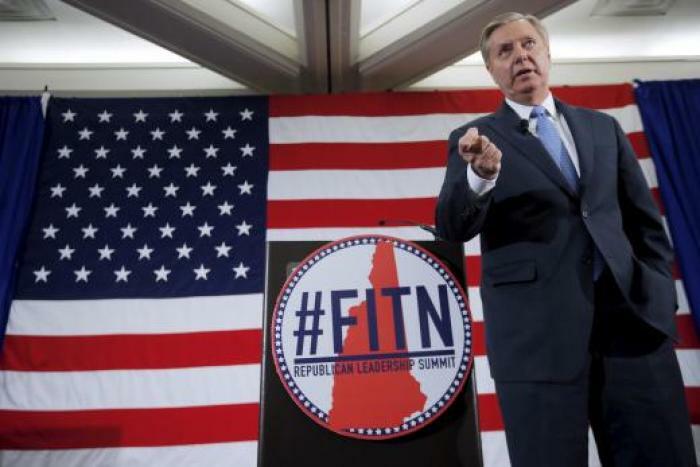 Senator Lindsey Graham, R-S.C., will formally announce his candidacy for president on June 1. He said he's running because "the world is falling apart." "I am running because I think the world is falling apart, and I've been more right than wrong on foreign policy," Graham said during his Monday appearance on "CBS This Morning." "It's my ability in my own mind to be a good commander-in-chief and to make Washington work." The South Carolina senator will join a group of Republican leaders in vying for the presidential nomination. To date, Sens. Rand Paul, R-Ky., Ted Cruz, R-Texas, Marco Rubio, R-Fla., and Carly Fiorina and Dr. Ben Carson are already in the race. Louisiana Gov. Bobby Jindal, Wisconsin Gov. Scott Walker and New Jersey Gov. Chris Christie, along with former Govs. Rick Perry, Jeb Bush are likely to join the race as well, making it an incredibly crowded primary process. According to a poll by Quinnipiac University released May 6, Walker leads all candidates with 21 percent, while Paul and Rubio tied for second place with 13 percent. Graham was not an option in the poll. Graham will be one of the most hawkish candidates in the race. During his press tour on Monday, Graham spoke about the Iraq War, which could become a hot button issue during the primary and general election. He said on CNN's "Situation Room" that he doesn't blame former President Bush "for the mess in Iraq and Syria," but instead blames President Obama. "I think at the end of the day, if I know now — then what I know now, a land invasion may not have been the right answer, but Saddam Hussein was firing at American planes patrolling Iraqi skies under international law. He was killing his own people. The biggest mistake we made was leaving Iraq without a follow-on force against sound military advice," Graham argued, before going on to say that the main mistake was withdrawing all forces. "Leaving Iraq too soon, not leaving a residual force has resulted in what you see today and it is in our national security interests to get Iraq in a better position, and to do something about Syria. Syria is the most likely launching pad for an attack on the United States," said Graham. The third-term senator will make his official candidacy announcement on Monday, June 1, from his hometown of Central, South Carolina.